In an early test for both teams, neither seemed to get into a rhythm in the first half of the game. 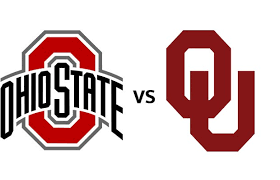 Oklahoma has statistically been more successful outgaining the often anemic Ohio State offense 222-92. They have outgained the home team by a large margin and they seem to be gaining more and more confidence as the game continues. Baker Mayfield has been leaning solely on his arm, which has been dicing up the Ohio State defense for 158 yards on 11 of 18 attempts, and he is gaining 8.8 yards per pass attempt but has no touchdowns to show for it yet. He has been banged up as well, as he can be seen limping off to the sideline after taking a few huge hits. So far Mayfield has been sacked twice, both by Sam Hubbard. J.T. Barrett has struggled mightily, and he has been leaning more towards the designed QB runs, that have Buckeye fans scratching their heads. Barrett finished the first half 5 for 11 for 25 yards and also carried the ball 10 times for 35 yards. The first half ended in a 3-3 tie with Oklahoma turning the ball over three times. They had two critical fumbles and a missed field goal, in what appears to be a defensive struggle. Sooners also lost Mark Andrews, their big WR/TE to an apparent leg injury. The Buckeyes started the half with balance and they capped off the opening drive with J.K. Dobbins’ first touchdown as a Buckeye. Mayfield was quick to answer with a touchdown of his own to a 36-yard pass to Dimitri Flowers to tie up this contest. The Sooner offense also caught fire as Mayfield found his teammates for 2 scores, 1 by RB Trey Sermon and another to Lee Morris. Jordan Smallwood also found paydirt on a jet sweep. The Sooner defense clamped down and shut down the Buckeyes, only giving up two field goals in the second half. One in the early 3rd quarter and a second mid-4th quarter. After a failed onside kick, the Sooners continue to drive the ball and rack up yardage on the tired Buckeye defense. The Sooners win 31-16 with their rookie Head Coach Lincoln Riley, which is a rare and impressive feat in itself. This by no means knocks the Buckeyes out of the playoff conversation. There are obvious deficiencies on offense that need to be addressed all across the offense. There are obvious deficiencies on offense that need to be addressed all across the offense. The WR’s failed to separate, they were back to their old ways with the play calling, and J.T. Barrett’s issues accuracy and trust in his receivers. The Buckeyes will be back, so stay tuned Buckeye Nation. Meyer got badly out coached by Lincoln Riley. Maybe he should pay more attention to his team instead of criticizing other coaches. He is an egomaniac and classless. Understand where your coming from and it really addresses the issue of the comparison of coaching styles as in Meyer at this stage “thinking” he can employee top coaches rather than the “hands on” total control including play calling of a Lincoln Riley. Must be a frustrating situation for him.